After being embarrassed in the Roan By-Election, the PF Police have summoned Chishimba Kambwili to report to Luanshya Police today. No reason has been given as to why the Police want Mr. Kambwili. One of his lawyers has confirmed the development. Meanwhile, sources in Luanshya say the Luanshya Central Police Stattion is sealed with Police officers. This is a developing story. More details to follow. 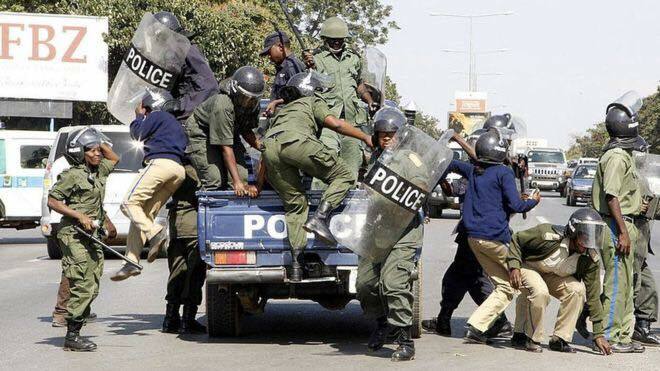 Zambian police they no longer do things on their on the follow what the commander in chief says. because if the continues our leaders will be afraid to talk against the government. Because they can get arrested,let the government do they work and the police to do their work according to the rules. The suspect behavior of our police service on how violence and opposition parties are being handled could only be checked if the clear demarcation of terms of reference were reintroduced between a riot wing (mobile) and that for civil adherence to laws. The old days mobile unit operated on a tooth for a tooth basis as a no nonsense instant disciplinarian outfit thus their different kind of uniform. My guess is that the current behavior of our police officers would see change to how law is obeyed!